The no compensation panels below have been optimized for human peripheral blood to help identify common cell subsets. Useful as a simple four color panel or a great starting point when designing larger and more complex panels. To identify T, B, NK and myeloid cells in human peripheral blood. To identify activated, memory and naïve subsets with helper and cytotoxic T cells. To identify naïve, memory, transitional and plasmablast B cells. To identify NK and NKT cells and various myeloid populations with peripheral blood. Fig. 2. Identification of activated CD8 T cells. A, CD3 and CD8 staining. B, HLA-DR and CD38 shows activated cells in the top right quadrant. Fig. 3. Identification of memory and naïve CD4 T cells. A, CD3 and CD4 staining. B, CD45RA shows naïve cells in the top left and CD45RO shows memory cells in the bottom right quadrants. Incorporating CD27 or CD62L into this panel will allow the identification of effector T cells. Fig. 4. Identification of regulatory T cells. A, CD3 and CD4 staining. B, CD127 and CD25 staining reveals the Treg population. Fig. 5. Naïve and memory B cells. A, forward and side scatter. B, identification of lymphocyte population. 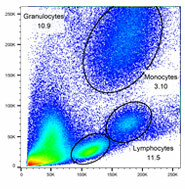 C, naïve B cells can be seen in the bottom right and memory B cells in the top left quadrants. Fig. 6. Identification of NK and NKT cells. A, CD45 and CD3 staining. B, gated on the Non T, CD335 and CD56 staining reveals the NK population. C, gated on the T cell population reveals the NKT cells. These no compensation panels are not available as pre-mixed four color panel cocktails and therefore may need to be optimized. Pre-optimized panels for human, mouse, rat or dog cell surface markers are available on our antibody panels and cocktails webpage. If you can’t find the antibody you are interested in, search our database of over 3000 flow cytometry tested antibodies. To help you analyze your samples, information on the proportion of these populations in human blood can be found on our cell frequency page. When performing multicolor flow cytometry, you should consider careful sample preparation, Fc blocking, inclusion of a live/dead dye, doublet exclusion and using the appropriate controls. For more information, watch our flow cytometry webinar Optimize your Flow Cytometry or visit our application resources page.